For the casual visitor, it’s easy to miss that Southeast High School in rural Kansas—once among the lowest academic performers in the state—is in the midst of a profound transformation. Like so many other Kansas schools, the building in Cherokee (population: 722) shows the telltale signs of a suffering economy. Bus routes have been cut, as have supplies. Custodians, secretaries and cafeteria workers took an eight-day pay cut. During the harsh winters, students bundle up to make it through classes where the temperature hovers at an uncomfortable, but cost-saving 68 degrees. Education Week, the Education Writers Association and The Hechinger Report partnered with 18 news outlets in 16 states to investigate how $4.6 billion in federal School Improvement Grants are being used to revitalize some of the nation’s lowest-performing schools. Interviewing scores of students, teachers, researchers and education officials at all levels of government, participating reporters set out to determine how the money is being spent and whether the changes it sparks are likely to last. But look deeper, and another picture emerges. Every one of those students is assigned a MacBook for the year. Teachers use iPads on classroom walkthroughs designed to improve instruction and boost student engagement. And the entire school improvement process is underscored by consultants from Cross & Joftus, a Washington, D.C.-area consulting firm. The schizophrenic portrait of school funding is not unique to Southeast. It is one of roughly 1,200 schools in the nation to win a federal School Improvement Grant (SIG), given to those in the bottom 5 percent in the country to spark radical improvements in school culture and student performance. The backdrop of the recession means that many of these schools have funding to do things they’ve never done at the same time that they’re hamstrung to fund many of the basic things educators typically take for granted. Southeast won a $1.4 million grant at a time when Kansas cut its education funding to the lowest levels since 1999. The grant allowed the school to take risks that have paid off: It has leapfrogged from among the worst high schools in the state to achieving “standard of excellence” ratings in reading and math, as well as 100 percent proficiency in science. While there is some cause for optimism nationally—two recent reports found that states and districts thought the funding was helping—there are also fears that the slow pace of economic recovery could undermine whatever gains schools are achieving through SIG. That quote may seem prophetic to school officials in Philadelphia, where epic budget shortfalls have led district leaders to announce that they are unsure they’ll be able to meet their payroll obligations in July. It’s a dizzying descent from just two years ago, when the district received more than $51 million in SIG funding for 27 schools, the largest total for any city in the country. The size of the grant was in many ways a vote of confidence in former Superintendent Arlene Ackerman, whose vision of school turnaround mirrored the federal government’s. Among other initiatives, Ackerman ushered in “Promise Academies,” poorly performing schools that got larger infusions of cash to support extended learning time, new teachers and coaches and a “parent ombudsman” to respond better to community concerns. When SIG came along, it was a natural fit. But after the first year of the grant, newly elected Republican Gov. Tom Corbett implemented an austerity agenda that cut $1 billion from education. Philadelphia, which has a nearly $3 billion school budget and educates some 12 percent of Pennsylvania’s public-school students, bore roughly one-fourth of that burden. The state cuts were the largest contributor to a budget shortfall that ballooned to more than $700 million—all but $22 million of which had been filled by the district as of March through cost-saving measures. Ackerman was ousted, and many believe her commitment to the Promise Academies, despite their cost, contributed to her exit. It struck some as absurd that the city was keeping positions like parent ombudsmen and student advisers—both funded by SIG—while it was cutting teachers and not paying for textbooks. Massive teacher layoffs, which by contract were to be conducted according to seniority, led to a lawsuit when the district sought to exempt the mostly young Promise Academy teachers in order to preserve the program in those schools. After a lengthy court battle, the district lost, and the staffs the academies had carefully assembled were decimated. Adding to the bitter taste left by the episode is a study performed by Research for Action, a Philadelphia-based nonprofit, which found that the academies performed better than a matched control group on every academic indicator measured. The state, however, is skeptical that the district can sustain those gains and is leveling a more serious charge—that Philadelphia is using SIG funds to back-fill the extraordinary cuts to state and local budgets. More troubling, at least one school altered its SIG grant mid-stream to allow for the hiring of a science teacher whose position Palakovic said was eliminated due to the cuts. Philadelphia explained that the new hire was necessary to keep class sizes small. Under the law, reducing class-size is a proper use of SIG funds, but the state suspects this represents another instance of the district using federal funds to supplant state and local funds, a violation of federal law. Fernando Gallard, a district spokesman, said Philadelphia was working to address the state’s concerns, but denied that Philadelphia was using SIG funds to back-fill cuts. Feather Houstoun, a budget specialist on the School Reform Commission—the city- and state-appointed body that governs the district—acknowledged that “successive belt-tightening had reduced the ability of the school district to track and monitor” its grant funding. Federal officials said they were unaware of any other suspicions regarding the use of SIG funds for back-filling. Jason Snyder, who heads the turnaround office at the U.S. Department of Education, reported that at least 12 schools had their grants terminated or not renewed for performance reasons. Nonetheless, Philadelphia’s conundrum may underscore the importance of a finding from a March report by the Center on Education Policy (CEP), an independent education think tank. While more than half of 46 states that responded to a survey indicated they had adequate levels of staff expertise to help SIG recipients, only slightly more than a third felt their state had adequate amounts of staff and time to assist with program implementation, including monitoring. The center’s report, which examined SIG implementation in Idaho, Maryland and Michigan, highlighted another aspect of federal funding with economic overtones. While districts had to list all of their schools that were eligible for funding in order to apply, they were granted considerable leeway in terms of how thinly they spread their funds—so long as no individual school received more than $2 million per year. This meant that states like Michigan, which had more than 100 schools in the bottom 5 percent, funded only 28 schools. In Saginaw, there are two high schools in the bottom 5 percent: Arthur Hill High School, which received a $4.4 million SIG grant, and Saginaw High School, which did not get funding. It is too early to answer a more compelling question: whether Arthur Hill High is showing greater gains in student performance due to the SIG funds. The difference between the SIG haves and the grantless have-nots is playing out more starkly in Las Vegas, where the Clark County School District is in arbitration with its teachers union to plug an $80 million budget shortfall. But due to the national scrutiny of SIG grants, Clark County is pouring additional resources—aside from the grant money—into helping turn around its SIG schools. While the district is trying to pass a $10 billion capital improvement plan to rehabilitate its aging schools—many with failing air conditioners and leaky roofs—the district funded renovations to the campuses of all of its SIG schools last summer. Dozens of maintenance crew members cleaned all the campuses, some of which had been left in abysmal shape. Western High School, one of the oldest in the district, completed a new broadcast journalism studio, library and science/nursing classrooms. Renovations at another building, Chaparral High School, ran as high as $2 million to clean up graffiti, etched windows and feces in the bathroom. All of these funds were reallocated from the district’s maintenance fund, which pays for annual school upkeep. 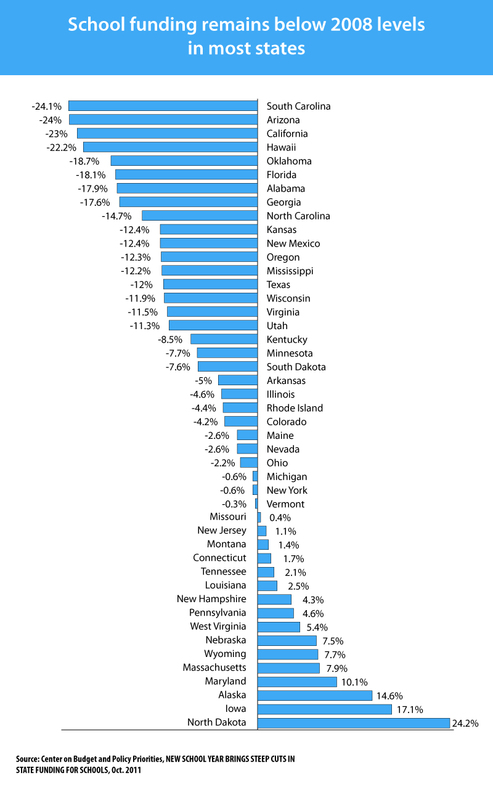 With the education sector of the economy emerging slowly from the recession, some states are anticipating level funding for their education budgets next year, while others are hopeful they’ll be able to restore some cuts. This hasn’t quelled a near-universal source of angst for SIG schools—the issue of how to sustain programs once the grant funds run out. It’s a palpable fear at Harding High School in Bridgeport, Conn., where a $2.2 million SIG grant has sparked a fragile recovery. With the help of Global Partnership Schools, a New York City-based consulting firm, Harding shows some encouraging signs. Daily attendance is up sharply, now at 85 percent, compared to 60 percent a year ago. And the number of failing grades fell to 26 percent in the first quarter of the school year, down from 34 percent a year ago. While acknowledging the gains, new Superintendent Paul Vallas, a nationally known reformer, considers himself largely unimpressed. Given the size of the grant, he expected to see more visible signs of academic improvement. And, like others, he worries about the future. No one knows what will happen to SIG-funded programs such as the reading laboratory, the summer and Saturday classes, the hallway “climate specialists” or a Virtual Academy for online learning. Andrew Brownstein is an editor with Thompson Media Group in Washington, D.C. He writes about federal K-12 education policy. This story was produced by The Hechinger Report, the Education Writers Association and Education Week. Reporting was contributed by Robert A. Frahm of the Connecticut Mirror, Dale Mezzacappa of the Notebook, and Paul Takahashi of the Las Vegas Sun.